What is it about warm sunny mornings that sets the ambiance dial just right? Today everything seemed perfect. Nothing poked or prodded or irritated. I looked out and saw skies painted in that deep summery blue with lazy white clouds floating by. Energetic breezes did that funny little whistle through the open windows and caused the curtains to billow back and forth. How can such a simple thing as billowing lace at a window add so much pleasure to one's day? But it does, doesn't it? Blowing in with that breeze there wafted old, old memories and I felt like I was back in the farmhouse kitchen of my girlhood. In my mind, morning sunshine always seemed to stream into our kitchen, lighting up the cornflakes box if it was breakfast time. With warm summer days, window sashes would be lifted and gauzy curtains would waft in the draft. Saturdays used to be very busy days in our family. The house would get cleaned within an inch of its life; furniture and floors were waxed and polished. Glorious things would be baking in the oven, and sometimes piles of homemade buns filled the counters and table as they cooled on wire racks. Never mind the cookies, cinnamon buns or pies. There would be a general feeling of well-being about the place, even in the busyness; perhaps it was because everything was being set to rights again. And often, Saturday preparations were harbingers of Sunday dinners, when my mom would invite families home for a big dinner after church. Siblings and I always hoped it would be a family with kids our age to add to the festivities of sharing food in that inviting, sunny kitchen. 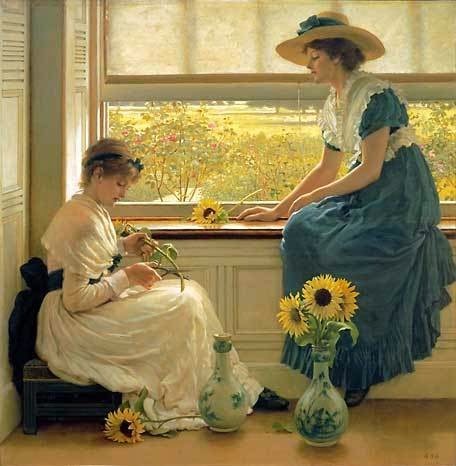 Today, I felt that sense of well-being wafting through my own windows. Birds chattered and robins splashed in the bird bath. The house filled with the fragrance of jelly roll cake baking in the oven -- it used to be one of those favourite baking staples in our house growing up. And although sunshine doesn't stream into my current kitchen till late in the afternoon, it still felt all bright and sunny this morning as I mixed the batter, whipped the egg whites and stirred the frothy lemon pudding. 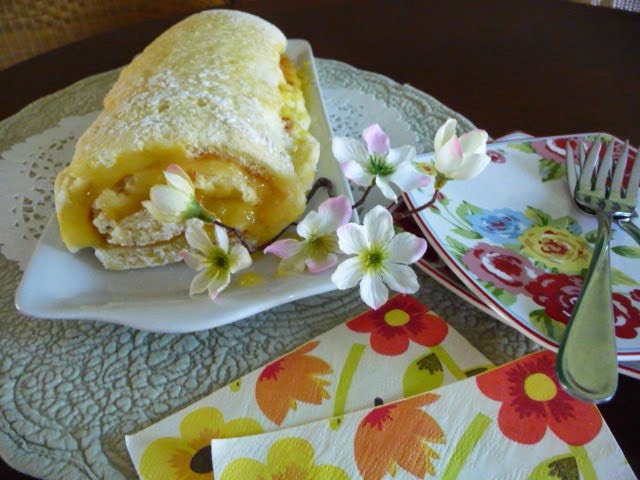 It's been years since I made homemade jelly roll. I forgot how quickly one has to get the wax paper off the bottom when you take it from the oven, and get it rolled up while it's hot, hot, hot; otherwise, as you can see, it cracks. Fortunately, cracked or not, the lemon didn't leak out and it was still delicious all the way. Paired with a lovely Yorkshire black tea, it was practically perfect! So thanks, Susan Branch, for sharing your recipe with all your girlfriends and for wooing me into baking this succulent treat to enjoy on such a beautiful afternoon. And if that isn't already enough, we're tuning this fine day into evening as we spend it with friends at a Strings Quartet classical music concert. Indeed our cup runneth over. I'm wishing you full and overflowing cups too. It sounds like the perfect day. Here your jelly roll, which looks delicious, would be referred to as a Swiss roll. You have described such a beautiful day that I am leaving wearing a smile and pondering a little baking. I have ever been brave enough to make a Swiss roll.Yours looks delicious! You've described a lovely day that reminds me of the Saturdays of my childhood, too. Baking, cleaning, preparing meals for Sunday - I sometimes miss that routine. 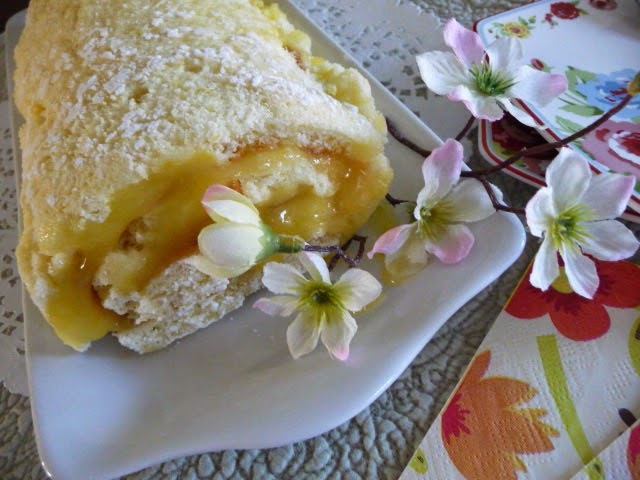 Your jelly roll looks scrumptious and how fun to have a concert to attend. Wishing you a sunny week ahead. It sounded like a perfect day, in every way! You always add to my day with your words. 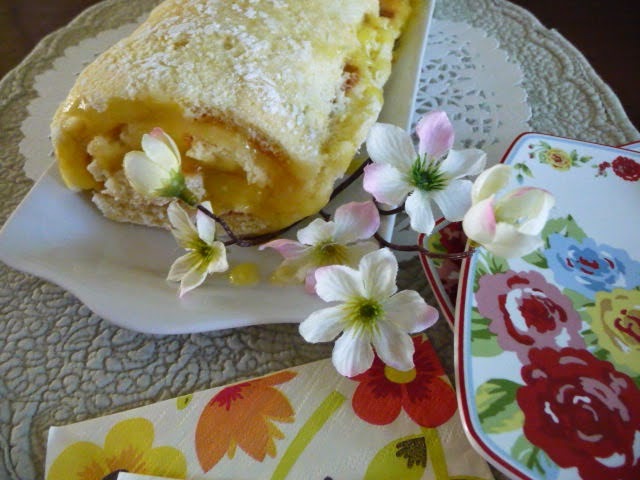 Yum...Lemon Jelly Roll. I so enjoy anything lemony and this dessert looks delicious. Oh, and Yorkshire tea is my favourite cuppa! What time do you want me there to help with that Jelly Roll and pot of tea? o) A friend goes to England almost every year and she introduced me to Yorkshire tea and now I'm hooked. I enjoyed hearing about your day. It sounds like the perfect way to spend a Saturday.